It is interesting to consider the history of dressage training in order to understand the background and context of this gymnastic art. Man's relationship with the Horse began many millennia ago, and it has been a crucial part of our development as a species. The practice of riding horses is estimated at having begun between 6000 and 4000 BC. 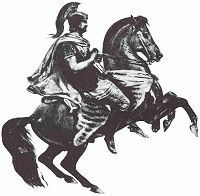 However dressage as a considered approach to training horses for riding began with the Ancient Greeks, in particular the Athenian Cavalry Commander Xenephon, who is responsible for the first recorded writings on dressage training. He wrote his treatise 'on the Art of Horsemanship' in 360 BC. Xenephon (right) was the first known trainer to understand the importance of the rider's position to dressage training, and to apply a more intelligent and compassionate approach to the horse compared to the methods of other horsemen of the era. 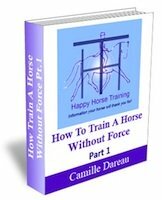 So dressage training has its origins firmly in the military use of horses, to make them more maneuverable and obedient in battle, also to improve their strength, stamina and agility. The Ancient Greeks approach to training the horse was continued by the Romans (left), for whom the horse was also a crucial part of their military power. 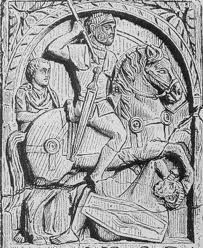 With the fall of the Roman Empire this understanding and refinement of horsemanship was lost in the brutality of the Middle Ages, where much heavier horses were favored for use with heavy armor and weapons, but the Renaissance brought back the need for speed, agility and maneuverability of horses in battle. 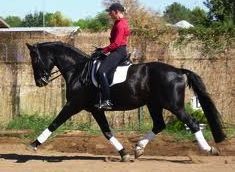 With the increasing popularity of indoor riding practiced by the royalty and nobility, dressage training started to become an art in its own right, with the development of the dressage movements, such as lateral work, piaffe, passage, and airs above the ground (the levade, courbette and so on). At this time dressage training started to become a much more refined activity than the standard training of horses for the military. Above its original practical use, it began to take on entertainment value in the upper echelons of European society. This was the age of many of the great masters of Classical dressage training, as methods were perfected and recorded in writings and art. Dressage had come to be seen as an important part of the education of the young nobility, as much as a character-forming process as a way of expressing their elevated status through elegant parades and displays. 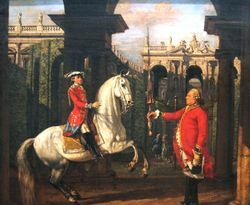 Although the military use of horses eventually declined, some of the Classical Schools of Dressage founded at this time, such as the Spanish Riding School of Vienna, remained and preserve their tradition to this day. However in modern times, the focus of most dressage training has moved onto its practice as a competitive sport. This has brought about a great change in the type of horse favored for dressage: from the compact Iberian type suited to collection and the high-school airs (above right), to the large and powerful warmblood (below right), developed for its capacity for spectacular extension. Although modern dressage has developed into a specialized equestrian sport, it should still be seen as the foundation for all the equestrian disciplines, being the means by which the horse is straightened and brought into balance with the rider so that the horse's full power can be applied to any activity. There is still a significant divide between the classical school of Dressage training, and the competitive approach. It is interesting to consider the origins of this difference. 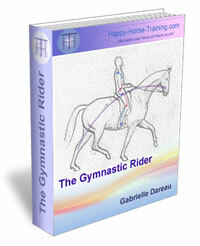 The emphasis of the light hand and the independent seat in classical riding comes from the necessity in cavalry riding of the rider using their hands to manipulate weapons, and the body (the seat, legs and posture) to control the horse. The fact that in a battle situation, the horse was genuinely submissive to these aids, and not controlled mainly by the hand, would often have been a matter of life and death. 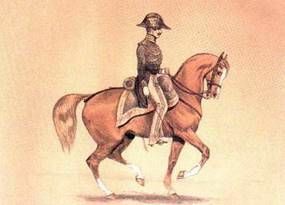 The development of the character required by military officers of the time to be courageous, noble, humble, responsible and so on, went hand in hand with their approach to dressage training. This implicated an inherent respect of the horse, and an attitude of self-improvement which is not required by the competitive dressage goal - an essentially egotistical endeavor. Anyone who has set out to ride well, without shortcuts, will know that it requires a great deal of introspection and character-forming, particularly the honesty and determination that allows the rider to see what he needs to improve in himself, instead of blaming the difficulty on the horse. In modern competition-orientated dressage training, these values are no longer relevant because they won't necessarily add to your competitive success. For example, it doesn't matter if a top rider's horse only lasts until the age of 15 before breaking down, there is always another up-and-coming prospect to achieve more success. Neither does the modern horse have to posses the resilience and genuine submission to be able to take its rider into battle. It is perfectly accepted for modern dressage horses to be held in and controlled by the bit, as the rider only needs to take the hand off the rein for the moment that he removes his hat to salute at the beginning of the test, and of course to wave to the crowd at the end. Therefore the independent seat effectively becomes an irrelevance. Finally, the character that is encouraged by the competitive environment is essentially the pursuit of winning above all else, including the welfare of the horse. To balance the argument however, it is certainly not the case that there were no forceful training practices in the days of classical dressage. Even some of the 'great masters' such as François Baucher (left) were well known to use extremely severe bits and spurs, applying them with a great deal of force. 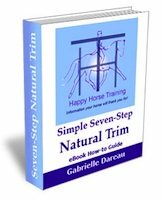 In terms of management, the horse's natural requirements for health and happiness have never been a great concern in classical dressage training. 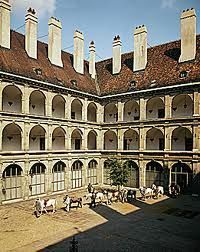 This is perhaps partly because the great dressage schools of the renaissance in France and Italy, where the nobility rode, were usually situated in large cities, so horses in training were permanently stabled with no possibility for freedom or social interaction (for example the stables of the Spanish Riding School of Vienna, illustrated here). 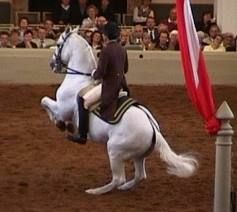 Of course this situation has not changed for most modern dressage horses. This is why we have to put our focus on doing things in the right way, intelligently, instead of adhering to some particular school of thought. Horses being ridden with hollow backs are just as common in Classical dressage as in competitive dressage, and there has been good and bad riding throughout all periods of the history of dressage. We have to remember that no matter how much we study and admire the great masters of the past, Dressage training is not an intellectual activity. It is a living art which can only be preserved by individuals who take the time and effort to learn the unique gymnastic skills involved, and pass their understanding on to others through good teaching. The principles of true engagement are universal and apply to any horse, no matter what its breed, purpose or era in history, and this engagement, achieved by intelligent dressage training, is the most profound connection that it is possible for man to achieve with the horse.